Optimized Plumbing & Piping is Sonora, Ca based plumbing and water heating company capable of all aspects of the plumbing industry. We are proud to offer specialized skills in Water Heater Installation and Repair. Whether it is a Repair, Replacement, or an upgrade to a Tankless Water Heater, or any other energy efficient model….we can help! If you use hydronic heating or radiant floor heating we can provide boiler replacement too. Call 209-352-4294 and ask if we are offering our $100 off water heater install coupon! Our training sets us apart! We are skilled in the installation and repair of all existing types and brands of Water Heaters currently on the market. We have level 2 training from Navien America to install or service their premium condensing tankless water heaters. We are certified from AO Smith to install heat pump water heaters. We have also taken classes from AO Smith University on residential gas and electric water heater installation and service. We participate in the California Solar Initiative and have gone through the training to make our customers eligible for rebates on solar water heaters. This is on top of the 5 years of classroom and on the job training our technicians have in the plumbing, and water heating industry. We think this makes us the most well trained company in the area, and you will see the difference in the quality of work and you can rest assured that our installations won’t put you or your family in danger. Solar water heaters consist of collector panels, a storage tank, pump, and a heat exchanger. The collectors heat a glycol solution that is circulated through them with a pump. That glycol solution moves to a heat exchanger which transfers the heat from the sun to you potable water and stores it in a tank for later use. Solar water heaters are great because they can save you a lot of money on energy bills, and they last for years. Tankless water heaters are a great way to save on your home energy cost, and condensing tankless water heaters are even better! A condensing tankless water heater can have an energy factor of .98 and is so efficient at using all of the heat generated by combustion that the flue pipe can be run in PVC pipe. Another energy saving feature is tunlike other tankless models where a pilot light must stay lit these models will light the flame electrically so no more wasted gas from a pilot light that always stays lit. 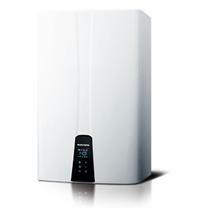 Hybrid water heaters use a heat pump when possible to heat water more efficiently than standard electric water heaters. They come with a powered anode rod which means less maintenance, and a longer lifespan than a standard water heater. They are fully electric and require no gas connection or flue pipe. They are a great choice if you want to replace an old electric water heater with a new model because they can reduce heating costs by up to 66%. Whether you want an electric water heater or gas water heater we only install good quality. All of our water heater installations use water heaters with brass fittings instead of plastic. This is because we believe if it needs to be done, it needs to be done right. You will find that the other materials we use are high quality as well whether it’s a gas valve and flex connector, or water shutoff valve and flex connectors we make sure you have good quality material installed to uniform plumbing code specifications to ensure years of trouble free use, and the safety of you and your family. With our specialization in Water Heaters we have come to find most homes are in need of a Water Heater upgrade. These days there are many options to save you time and money when it comes to providing hot water for your family or business. Please call us Today to schedule your water heater installation at 209-352-4294. We provide water heater installations, and service for Tuolumne County, and Calaveras County, including the towns of Sonora, Twain Harte, Mi Wuk Village, Groveland, Copperopolis, Angels Camp, Murphys, Arnold, and San Andreas. View our Water Heating solutions listed on the right side of this page. Also check out our on water heater problems and solutions.